Health Services has earned full accreditation and reaccreditation for another three years from the Accreditation Association for Ambulatory Health Care (AAAHC). The AAAHC accredits more than 6,000 medical facilities with ambulatory care, and most frequently serves as the accrediting body for college health centers. To secure reaccreditation, Health Services had to meet the AAAHC’s 23-chaptered checklist, which covers all aspects of care, including credentialing and licensure of professional staff members, peer chart reviews, customer service, privacy, health promotion, pharmacy services, laboratory quality controls, patients’ rights and responsibilities, administration and business practices, risk management, facility safety, EMS procedures, quality improvement studies and restudy in all departments, and updating of policies and procedures throughout all aspects of the care delivery process. Health Services demonstrated substantial compliance with these AAAHC standards. 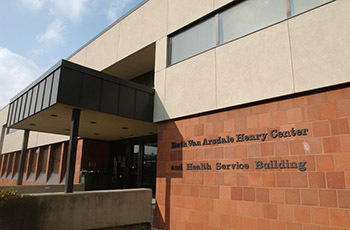 “The AAAHC reaccreditation of Health Services assures our students are receiving the highest quality of care from properly licensed, trained and qualified medical staff; the facility meets standards for safety; billing and other business practices are aboveboard; proper documentation occurs in all areas; protocols are in place that reflect best practices industrywide; privacy is protected; customer service is prioritized; and health promotion is supported,” says Ben Domingo, director of Health Services.